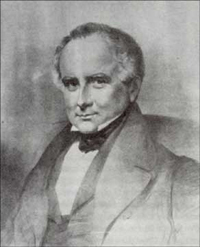 Haliburton was born in 1796 in Windsor, Nova Scotia to Loyalist parents originally from Connecticut. He was educated at King’s College in Law. He practiced law, and then became a judge, sitting on the Nova Scotia Supreme Court in 1841. Haliburton retired in 1856, moved to England and sat in the House of Commons there until his death in 1865. His career as an author began in 1835 when he began to write the short tales of Sam Slick for the Novascotian. This continued until 1836, when the collection of short stories was published as a book, due to their immense popularity. The Clockmaker; or The Sayings and Doings of Sam Slick of Slickville was the first Canadian bestseller, and was the first Canadian work that was a bestseller in England. Using satire and the Yankee character, Sam Slick, Haliburton critiqued Nova Scotians and what he perceived as their shortcomings. Haliburton was an inflexible Tory who had a love-hate relationship with Nova Scotia. He emphasized the colony’s British heritage and believed that it would flourish under a strong monarchal system, governed by an educated elite, and guided by a state church, safely located within the British Empire. He saw unlimited potential in the colony’s natural resources and encouraged industrial and agricultural advances, such as the railway system. Haliburton also saw Nova Scotians as lazy and backward in their political beliefs, which he attempted to rectify through his satirical writings. He also critiqued the United States, because they had rebelled against British rule. In the 1840’s, Nova Scotia moved to a more responsible form of government, replacing the predominantly Loyalist, Anglican 'family compact' system that was in place. Haliburton did not believe in responsible government, nor did he believe the colony should join Canada, because he thought Canada was just going to be swallowed up by the United States. After leaving Nova Scotia for England, he continued using his character of Sam Slick to critique both England (for what he felt was an abandoning of the Colonies) and Canada (for their move towards responsible government). He also wrote many other works that critiqued the politics and the policies of the time. His original collection of stories involving Sam Slick, however, remained the most popular and the most powerful.